The trap builds on the basic design with a more useful product. The traps offer an all-around pest solution. The bait station allows you to get rid of mice with a hands-free method. If you have a rodent issue, you’re not alone. Over 20 million homeowners face the same problem each year with the most infestations occurring in fall and winter. Mice can cause significant amounts of damage and increase the risk of electrical fires. They also carry over 35 diseases which makes ridding your home of these pests imperative. Tomcat manufactures a full line of rodent control items to help you manage the issue efficiently and thoroughly. You’ll have several options in addition to the classic spring-loaded trap invented in 1894. Our Top 5 Best Tomcat Mice Products 2019 review will provide the information you need to choose the best ones for your situation. No matter what type of problem, you’ll find something to get the job done to restore your peace of mind. Continue reading to learn more about the company’s lineup of quality products. Why Should I Buy Tomcat Products? What Is the Best Way to Use Rodent Control Products? How Can I Prevent a Recurrence of a Mice Problem? It is an inexpensive solution. You can reuse them which increases their value. They come with a satisfaction guarantee. They have a bait well for optimum placement of food or an attractant. While you don’t have to handle the dead mice, you’ll still see them. You can buy it in either two or four packs. Each trap measures 1.5 x 6 x 4.5 inches. 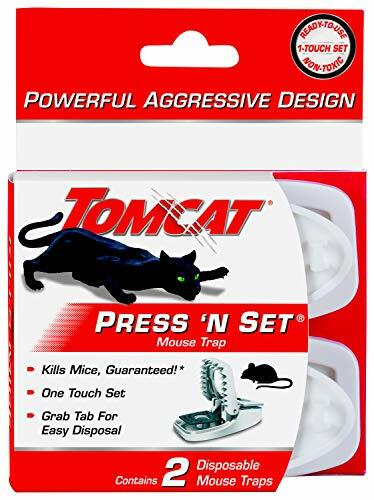 The Tomcat Press ‘N Set Mouse Trap is a redesign of the classic model that is made of plastic with a simple-to-use mechanism. It differs with the addition of a bait well that allows you to put in the correct amount in the right place for maximum effectiveness. It also offers a no-touch solution to minimize contact with the rodents. The traps work as advertised. Place them where you’ve seen signs of activity and wait. The manufacturer guarantees their products, so you can rest assured that it’ll work or you’ll get your money back. They are useful for a variety of other pests such as insects. They are non-toxic to humans. They are not safe to use around children or pets because of the glue. You can get them in four or six packs. It uses eugenol for maximum stickiness and to attract insects. The mouse-sized traps are 0.6 x 3.4 x 4.9 inches. 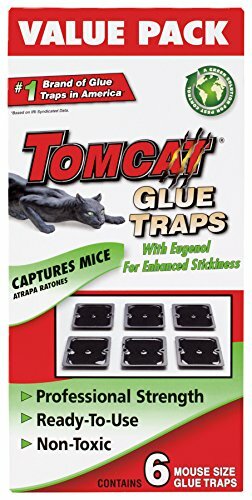 Tomcat Mouse Size Glue Traps provide an economical way to manage a rodent problem, particularly if you have a severe infestation. It will handle both rodents and other pests invading your home, making it an all-in-one solution. It has an attractant to get insects to the site to optimize your results. They offer an excellent option if you suspect you have mice in your home but haven’t seen a lot of sign. They are simple to use if you’re looking for a way to control pests and don’t have to worry about curious pets. You don’t have to handle the mice. It’s an excellent option if you have small children or pets. You can see when you’ve caught a mouse. You don’t have to worry about the rodents dying elsewhere in your home and leaving a foul odor. You can’t reuse them once the bait is gone. You can get them in a two or four pack. The trap measures 1.5 x 5.38 x 7.62 inches. Each one can kill up to 12 mice. Tomcat Mouse Killer II makes the unpleasant task of dealing with a rodent problem easier with a hands-off solution. They are ready to use out of the package with bait preloaded for indoor use only. Each trap can handle several mice if you have a heavy infestation. They are tamper-resistant, making them a safer option. The active ingredient in the bait is bromethalin which targets the nervous system to kill mice. It is effective and quicker acting than first-generation rodenticides. The bait stations offer a secure way to use this poison without risk to others. It can handle larger rodents too. It is disposable to minimize handling. It’s more expensive than comparable products. The package includes one trap. The dimensions of the item are 3.06 x 7.56 x 5.44 inches. It includes a four-ounce bait block, enough to kill 10 rats. 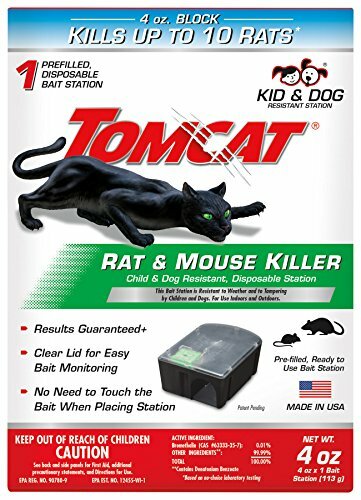 Tomcat 0370510 Tier 1 Disposable Rat & Mouse Bait Station offers a hands-free approach to dealing with a rodent problem with minimal fuss. Like the previous product, its design includes a bait station with a powerful rodenticide to kill pests quickly. It is sturdier and tamper-resistant for use around pets. It is ready to use with the bait already inside. Place it where you’ve seen signs of rodents. The clear window on the top allows you to monitor its progress. Once it’s gone, simply toss it in the trash. You don’t have to see or touch the dead rodents. You can see when the trap has caught anything. It can fit in corners or other odd-shaped spaces. There are two ways inside to make it easier to catch the mice. The labeling on the outside of the trap is not discreet. It costs more than other solutions. The trap’s dimensions are 11.6 x 13.3 x 4.4 inches. 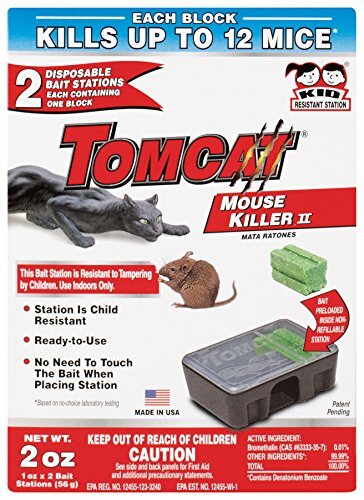 Tomcat Spin Trap for Mice offers an effective way to control pests without the unpleasantness of using spring-loaded items with the rodents in full view. Its design allows for easy entry by unsuspecting animals. You can make it more enticing with the removable bait cup to lure them inside of it. The indicator will turn from set to caught when there is a mouse inside. Then, throw the trap away for a hands-off way to manage a mouse problem. You don’t have to handle the dead mice or any poisonous bait for a hassle-free and safe fix. The manufacturer partners with the world-renown Bell Laboratories to produce its state-of-the-art pest control products. You can rest assured that what you buy is well-researched and safe for use as directed. When you’re dealing with pesticides, that is a primary consideration. It is the company’s specialty. Their solutions are science-based so that you know that you are getting a tested winner. The company began in 1974 with this mission in mind. Social responsibility is at their forefront. They have a best practices policy in force regarding recycling, packaging, and innovation. They continuously strive to improve their brand and production process. Begin by assessing your situation. The abundance of signs like droppings and gnawing will give you an indication of how severe the problem is. The more you see, the greater the issue. A common mistake among homeowners is not placing enough traps. Err on the side of caution and get plenty. The next step is the correct placement of them. Mice stick close by to their nests and don’t venture out far from them. If you only see evidence in one room, the chances are that it’s the only area you need to treat. Put baited traps along the walls where you’ve noticed activity. Peanut butter is an excellent choice. Dap a small bit onto each one. Many traps are reusable. It’s essential to clean them thoroughly between uses for the best results. Others are disposable, making your job easier. If you haven’t caught anything, move them to a different place until you’re successful. Use one trap every five to 10 feet to cover a room thoroughly. Keep using them until you are no longer catching mice. At the same time, make sure to prevent another infestation by following the steps that we’ll discuss next. Mice are opportunistic, seeking the most reliable sources for food and shelter. The best way to tackle a problem is to focus on these things. That means cleaning up any food waste including your kitchen and trash areas. They are successful because they can find these foodstuffs to ensure their survival. Make it difficult and remove these easy targets. These same precautions apply to pet food sources too. Pick up their food bowls between feedings. Store unused products in rodent-proof containers. These rodents also depend upon shelter for places to nest and travel. That means removing sources of nesting material like fibers and cleaning the paths around the places that hide them while they move to other areas away from their safe spots. They are reluctant to cross open spaces because they are vulnerable when they do so. If you have a fire pit, store your spare firewood far from your house. Wood piles provide an excellent hiding spot for rodents with a ready source of nesting materials too. Also, make your home inhospitable with barriers. That means sealing any possible access points around the perimeter of your home or other structures. You can also use repellents in conjunction with these measures as they won’t work on their own for effective control. Finally, stay vigilant for signs of an infestation, especially in areas where you’ve had an issue in the past. It’s easier to take care of a problem early instead of letting it get out of control. Mice breed quickly which can make a minor issue escalate fast into something more serious.